The very word soufflé sounds fancy. (It’s French, and French cooking is fancy, right?) The mythology surrounding the deliciousness of this classic dish, the difficulty of getting a perfect rise, and the tragedy of a fallen soufflé, can all be intimidating. I’m here to tell you that it’s a lot easier than you might think. This wild greens soufflé is a wonderful combination of rich eggs and foraged flavors. I like a combination of mild and sharp greens, like garlic mustard, dock, and nettles. Choose yours according to your personal taste. This recipe works equally well with fresh or frozen greens. Squeeze out as much liquid as possible from the greens after cooking, then purée them in a food processor. Warm the milk in the microwave, about one minute at full power. Remove from the microwave and set this aside. In a small saucepan, melt four Tablespoons of butter over medium heat. Add the flour, and whisk together the flour and butter until the mixture darkens slightly. (This will take about 3 – 4 minutes.) Reduce the heat to low, and add the warmed milk gradually, whisking to combine smoothly. Continue to whisk over low heat until the mixture thickens enough to coat the back of a spoon. Remove the mixture from the heat and let it cool for several minutes. Then, add the egg yolks one by one, whisking each one into the milk mixture. Add the salt, pepper, ground mustard, cayenne, onions, puréed wild greens, and cheese. Transfer the mixture to a bowl and set this aside. Use the extra butter to grease the soufflé dish(es). Solid butter works better than butter spray, because it stays in place on the soufflé dish; spray tends to run down the sides. I make this recipe in four individual 2 cup soufflé dishes, but you could also make a single, larger soufflé. In a clean bowl, use an electric mixer to whip the egg whites to soft peaks. Add 1/3 of the whipped egg whites to the greens mixture, and stir it together well. Then, add the remainder of the egg whites and fold them into the batter slowly and gently. Pour the batter into the buttered soufflé dishes, to within about 1/2 inch of the edge of the dish. Transfer the filled dishes to a baking sheet, and put the sheet on the lowest rack of your preheated oven. Placing the soufflés as close as possible to the heat (which comes from the bottom of the oven), will help you get a good rise. Set your timer for 15 minutes for small soufflé dishes, 30 minutes for a single, larger soufflé. When the time is up, if the soufflés have risen and the tops look golden brown, check for doneness with a toothpick or cake tester. The interiors should be moist, not wet, and the tester should come out clean. You may need an additional five minutes, but don’t over-cook. Once your soufflés are done, serve them immediately; they’ll start to fall as soon as they begin to cool. Thanks to Harold Magee I know that soufflés can be reheated and will re-rise, although not to their original height. Vegetable based soufflés like this one, don’t rise as dramatically as a plain soufflé, but they also don’t fall as much when they cool. 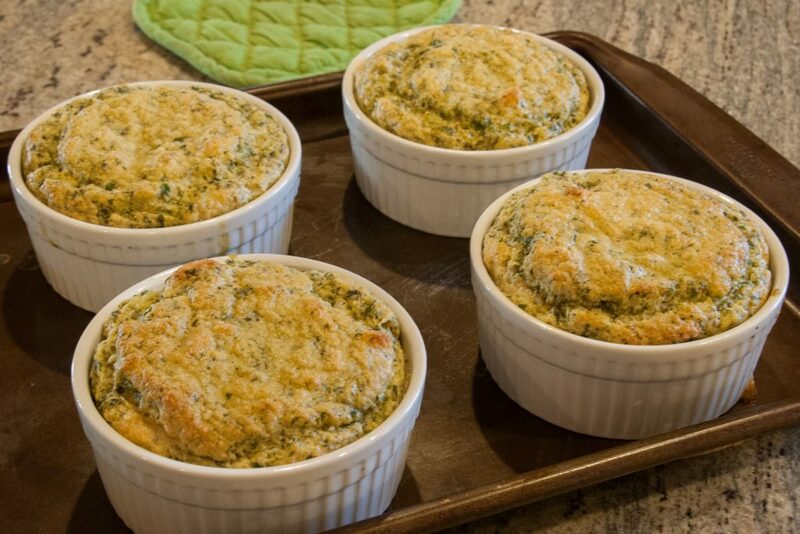 This wild greens soufflé makes a superb breakfast, an excellent vegetarian lunch, or an elegant side dish at dinner. And it’s not nearly as difficult to make as I thought it would be. You had me until I saw MICROWAVE. I will try this recipe, and will warm the milk the old fashioned way, in a pot on my stove. Looks good and thank you.